January 16, 2014 By This post may contain affiliate links. Cheese, Cheese, and more Cheese. 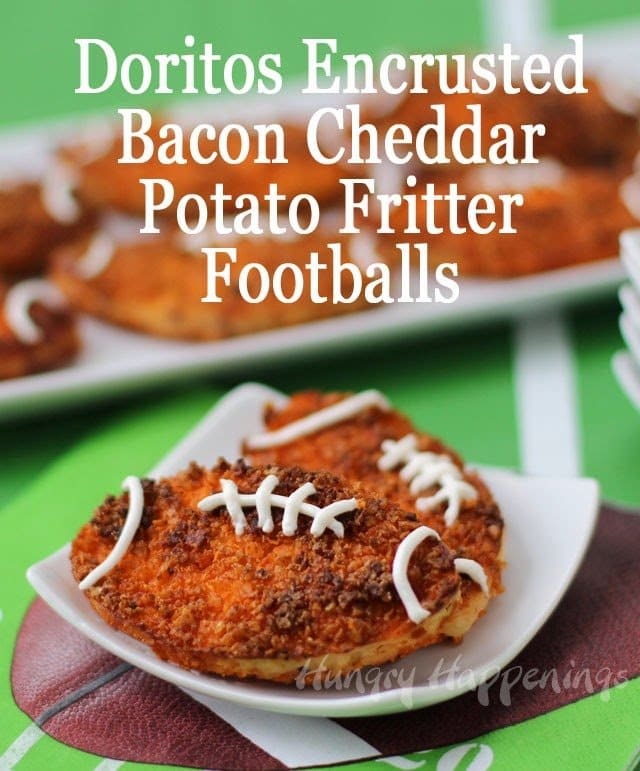 That’s what I like to hear when I come to a Super Bowl Party and these Doritos Encrusted Bacon Cheddar Potato Fritter Footballs will satisfy your every salty need. 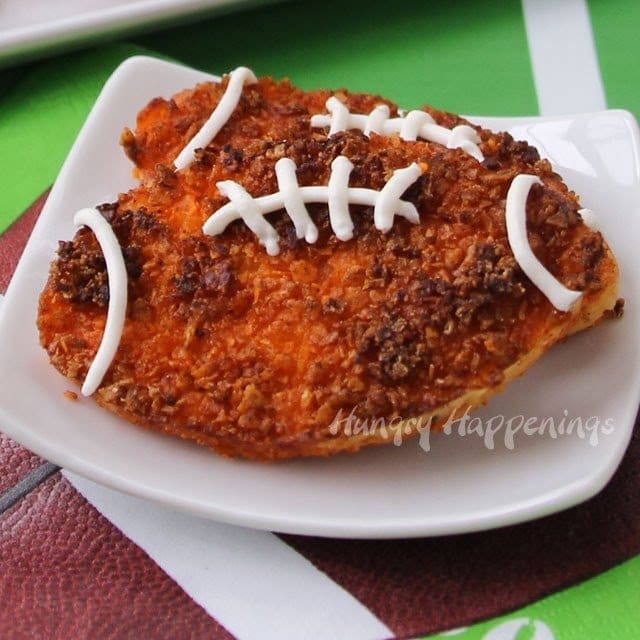 So yesterday I shared my recipe for Bacon Cheddar Beer Bread Footballs baked with a bacon crust. I don’t know how to top that, really. Bacon crust. 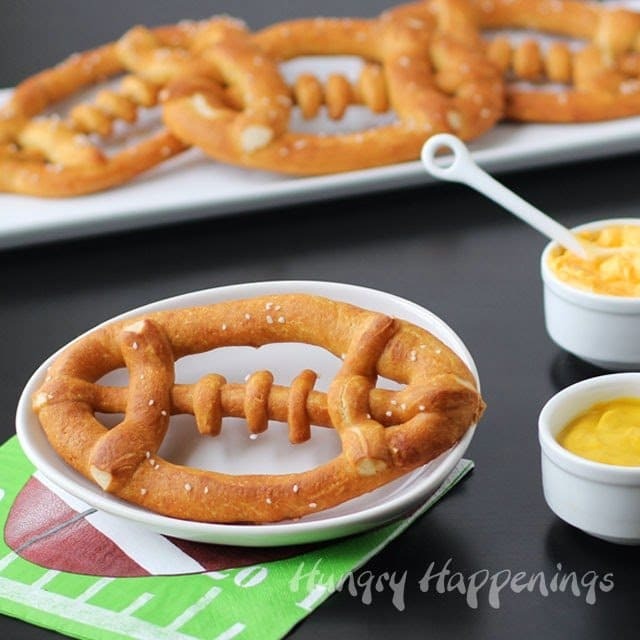 What more could you ask for in a Super Bowl appetizer? Well, you know me, I can’t stop creating just because I’ve come up with something as good as a bacon crust, plus I promised you more bacon cheddar recipes. I’m pretty sure this one wont disappoint. Yep, this time I made a Doritos crust. I have to admit that I much prefer sweets over salty snacks, but if you put a bag of Doritos in front of me, I will never, ever, turn them down. The nacho cheese flavor and crisp texture adds so much to these potato fritters.I didn’t forget about the bacon and cheese. They are in there too. I mixed them with Bob Evans mashed potatoes (my favorite mashed potatoes,) added crushed Doritos, baked them in a silicone football mold, then fried them to a deep golden brown. When I set out to make these, I thought I could just shape them and fry them, but they didn’t hold together well in the hot oil. When I baked them first in the football shaped mold, they held together perfectly. They actually tasted pretty good right out of the oven, but they weren’t as crispy as I wanted and were a bit more orange than I liked, so I fried them and they became crunchy and brown. If you like, you can serve them right out of the oven. 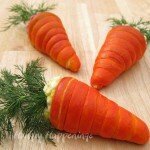 The great thing about this recipes is that you can bake them, refrigerate them for several days, then fry them just before serving. If you really want, you can even fry them ahead of time and reheat them before serving. This way you can relax and enjoy the game. 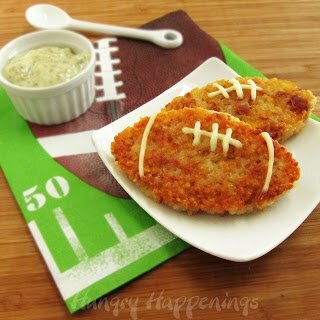 These Dorito Crusted Bacon Cheddar Potato Fritter Footballs are great for Super Bowl, football, and sports parties. Preheat oven to 350 degrees Fahrenheit. Stir together mashed potatoes, egg, cheddar cheese, and bacon. 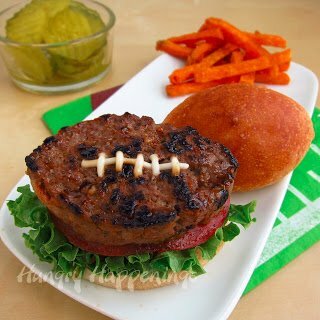 Grease the football cavities with butter. 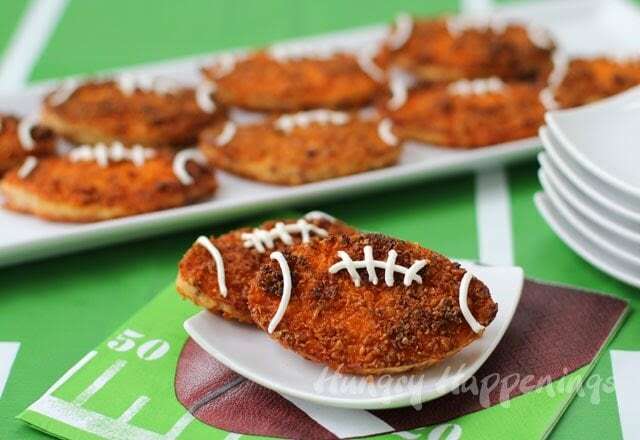 Sprinkle about a tablespoon of crushed Doritos into each football cavity. 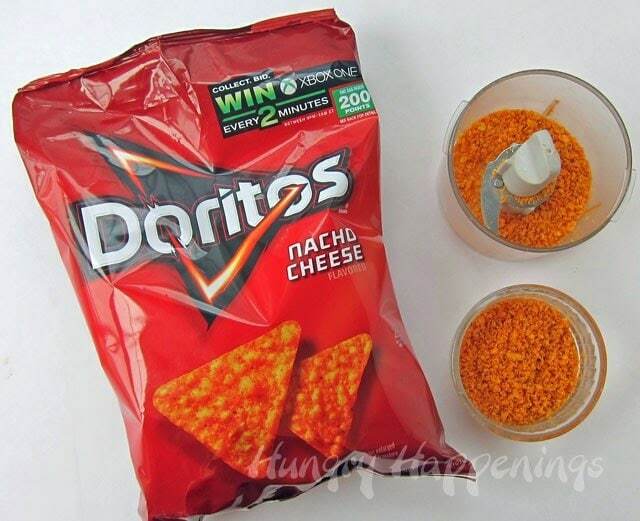 Sprinkle more Doritos crumbs over the mashed potatoes. Press the crumbs into the potatoes using your fingers. Bake for 15 minutes. 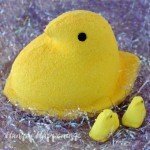 Remove footballs from mold. Heat a thin layer of oil over medium heat. Fry footballs until golden brown, about 30 seconds on each side. Drain on paper towels. Pipe sour cream laces and stripes onto footballs. Serve hot. 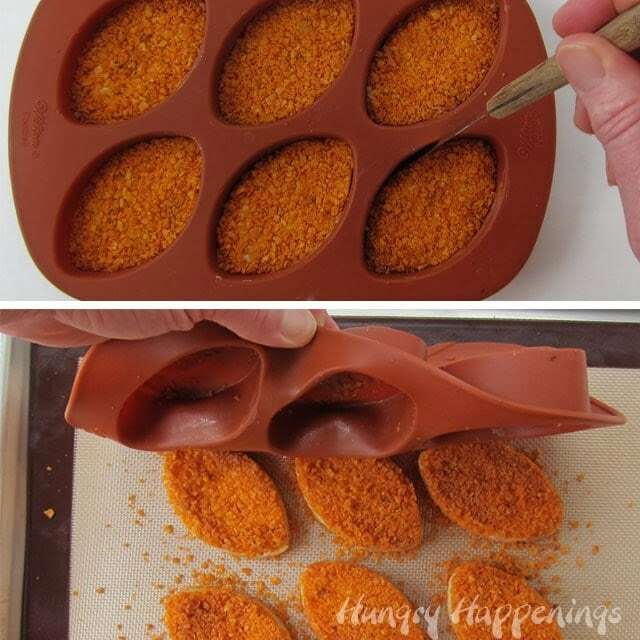 Crush the Doritos into fine crumbs, using a food processor, or by smashing them using a rolling pin, meat mallet, or the back of a pan. Grease the football cavities with butter. 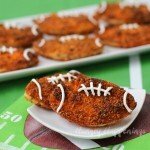 Sprinkle about a tablespoon of crushed Doritos into each football cavity. 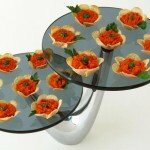 Spread the crumbs out to cover the entire bottom surface. Spoon about 2 tablespoons of mashed potatoes into each football. I used a #30 ice cream scoop.Then smooth it out into an even layer. Run a knife or metal spatula around the footballs. 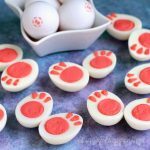 Carefully turn the mold upside down over and allow the footballs to fall out. They will fall out quickly, so be sure you turn it over close to the pan so you don’t break them.If you plan to serve them after baking them, you might want to leave them in the oven for another 4-5 minutes until a bit more browned. Heat a thin layer of oil over medium heat. I used a 12 inch skillet and started with 1/4 cup of oil, which I cleaned and replenished as needed. 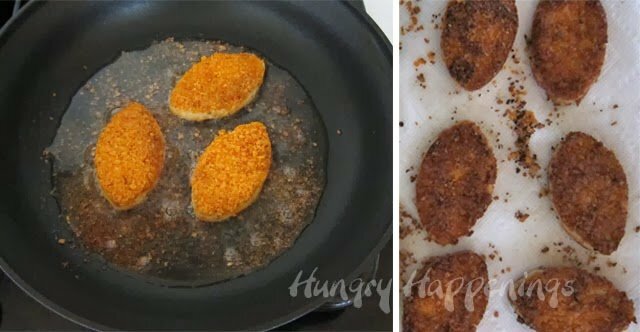 Fry the mashed potato fritters until deep golden brown, about 30 seconds on each side.I suggest you clean the oil after frying half of the football fritters. 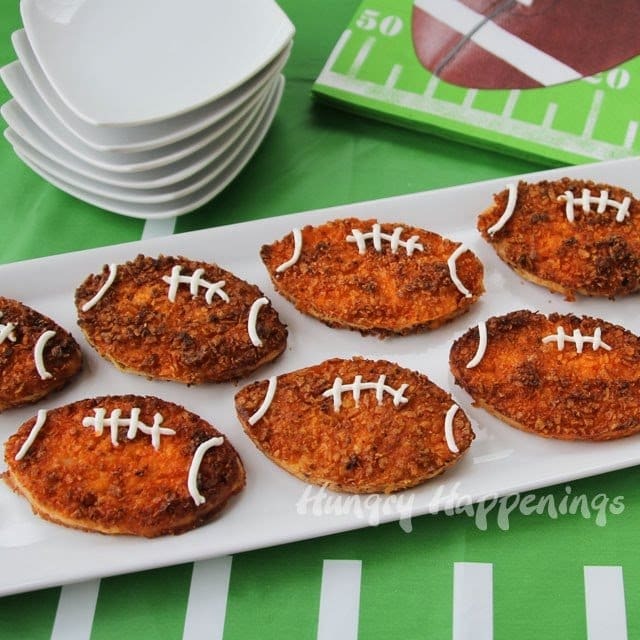 As you fry them, the Doritos crumbs will get really dark and will stick to the footballs. I poured the hot oil through a strainer then added it back into the pan along with a small amount of fresh oil. Set fritters on a paper towel to drain any excess oil. 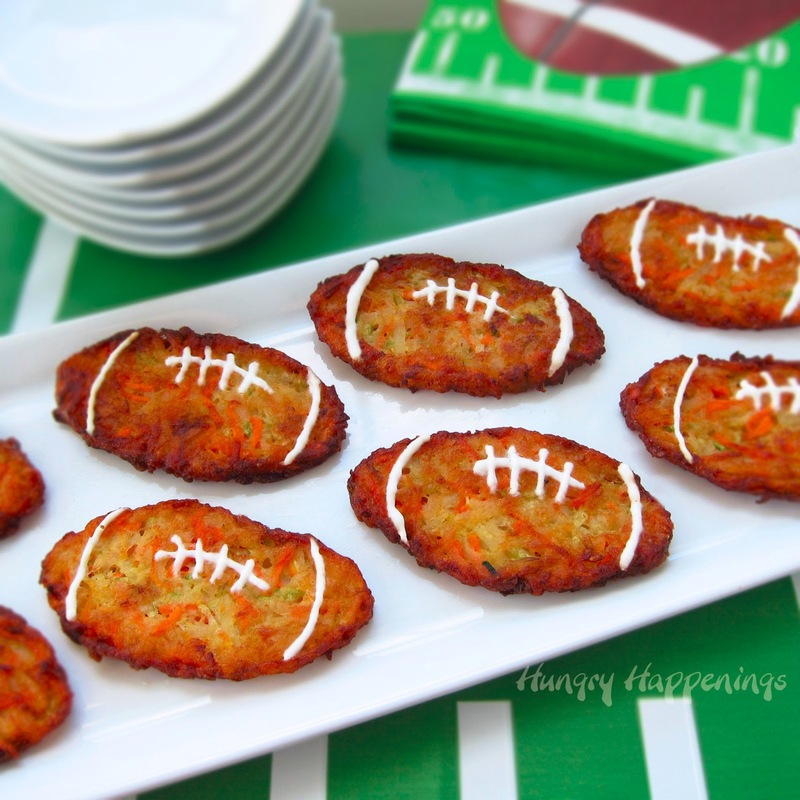 To decorate your football fritters, spoon a tablespoon or two of sour cream in a small zip top bag, snip off the tip and pipe on some stripes and laces. Best served hot.You can bake these and even fry them ahead of time, then reheat for 5-8 minutes in a 350 degree oven. I reheated some of these for my husband for dinner tonight and he loved them, as I expected. 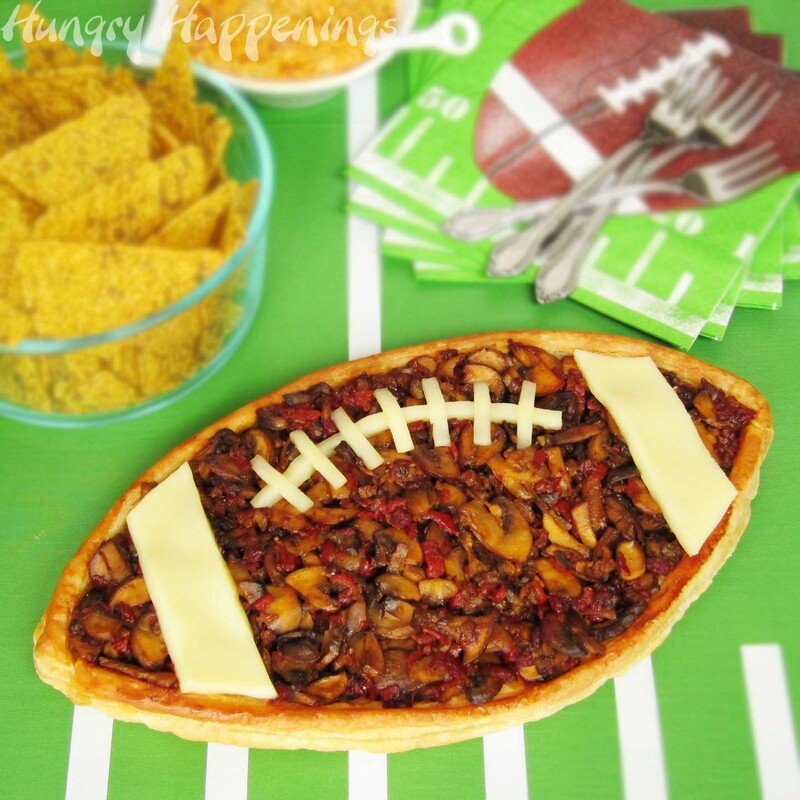 be sure to check out my Football Party Food ideas. Subscribe and get this FREE e-book! Thank you for subscribing. Shortly, you will receive an email with the link to your free pdf e-book, 10 Mistakes Made When Using Candy Melts and How to Fix Them. You will also get fun food ideas sent directly to your inbox. 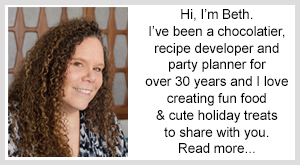 I hope you have fun recreating my food crafts and recipes. Oh my goodness, these look so good! I remember one summer back in Kingsport, Tennessee, my big sis and I were spending the day with our MeMaw. She bought us each our own snack. I chose a full size bag of Nacho Cheese Doritos. I ate the entire bag..no regrets. I can only imagine how good your kitchen smelled! It's a grandma's job to spoil her grandchildren! Oh, I wish I could go back to a time when eating an entire bag of Doritos would not lead to regret. It was so fun to eat as a child and not ever think about calories. Oh, how I miss those days. My kitchen did smell pretty amazing while these were frying. I had one hot out of the oil, and it was wonderful! treats. 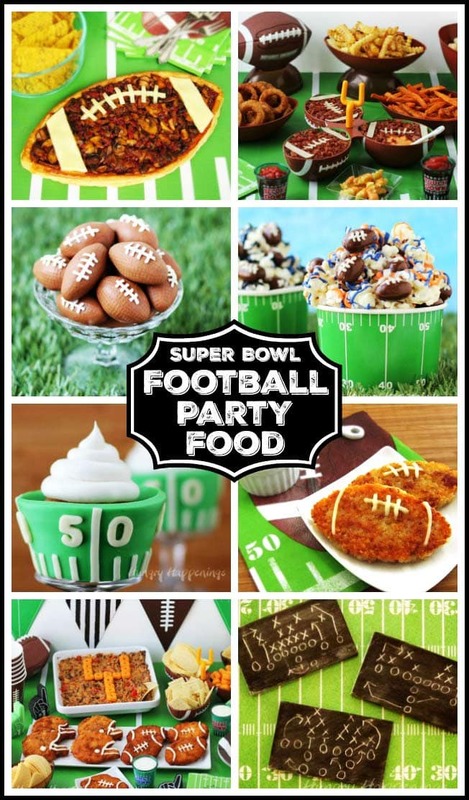 It would be the best football party in town! 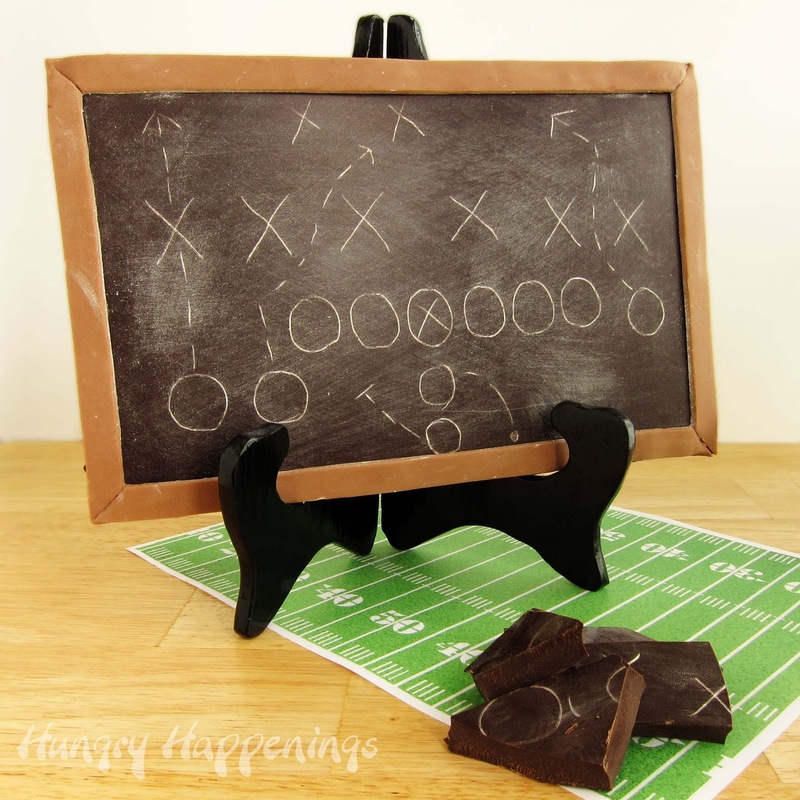 Yep, sometimes you just have to have this amazing combo together and what better time than at a Super Bowl party! 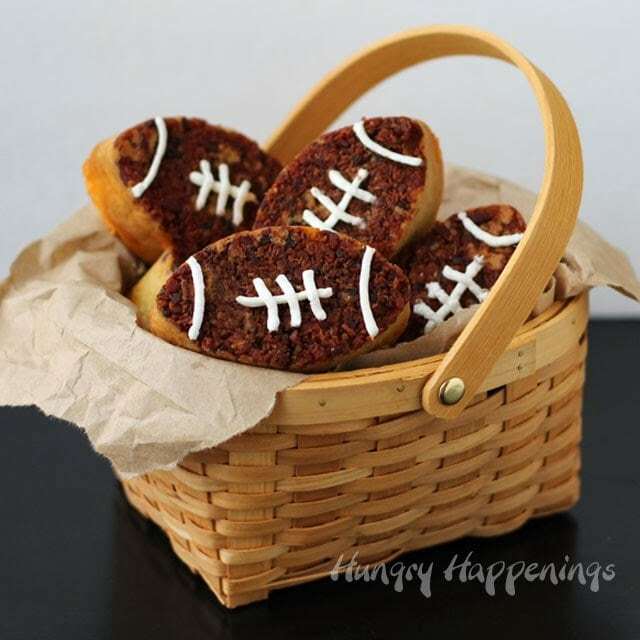 You are just on a roll with these football shaped treats! Another touchdown for sure! Thanks for linking up at Tell Me About It Tuesday. We hope you hop over and share with us again next week. 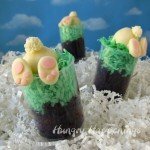 These look super cool and they sound yummy! Thanks for sharing at Tell Me About It Tuesday! I can't wait to see what you share next week! 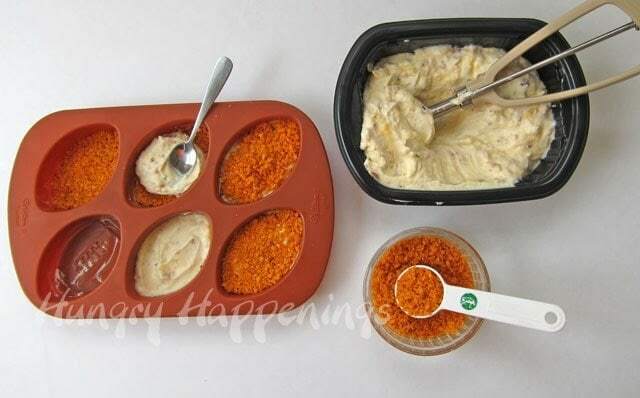 Even easier: replace the mashed potatoes with toaster hash browns (found in the freezer case) and you will save the baking step and improve the texture. Your delicious recipe has been nominated as one of the "Top 100 Best Potato Fritters Recipes on the Internet". You can view it and vote for it here: http://potato-recipes.org/best-potato-recipes/best-potato-fritters-recipes-internet/ (position #30). 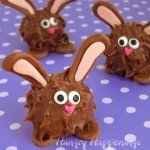 Hmm these look delicious, thanks for posting up this recipe, looks quite simple to make. Don't miss out on the fun! Join the newsletter. New recipes every week.